8) To dedicate one self to Lord Venkateswara and take absolute and comprehensive refuge in Him. 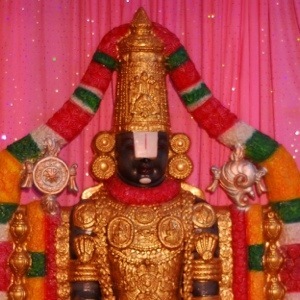 Those who are fortunate to have even a glimpse of the fantastic Idol of Venkateswara do experience the awe and satisfaction that leaves behind a lasting familiarity and nearness.Those who think of Srinivasa, either out of curiosity, or greediness, love of materialism, or fear or casual occurrence undergo a definite transformation of outlook, approach to life and morality. If such casual approach has a multiplier effect, could one imagine the far reaching impact of the Eight-folded dedication! As Fire is capable of pulling down a huge mansion within minutes, the stock-pile of sins gets ablaze into ash as fast, provided one takes the shelter of Srinivasa. Human life, which is indeed difficult to secure compared to myriad forms of creatures ranging from animals to insects, is stated to be well spent and appropriately lived through, if one takes asylum of that Supreme Power which is ‘Avyaktam’(Unknown), ‘Shasvatham’(Everlasting), ‘Vishnum’(All Pervading), ‘Anantham’ (Endless), ‘Ajam’(Unborn) and ‘Avyayam’( Never Spent out), called Venkateswara!